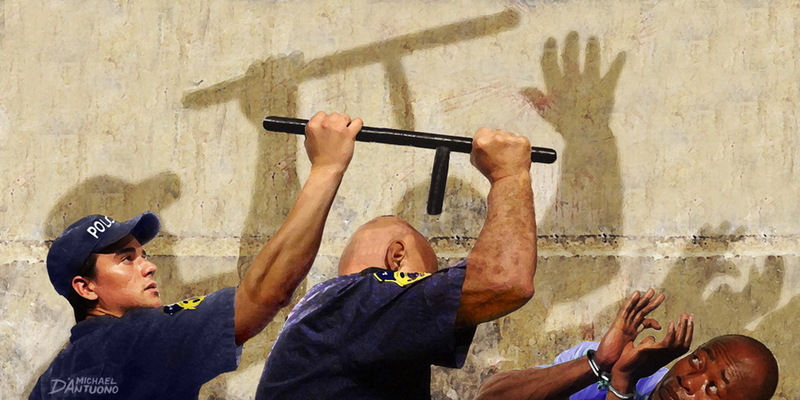 “Broken windows” policing is a criminological theory that suggests a series of unpunished minor crimes, as represented by the eponymous broken window, eventually spirals into a cascade of more serious violent crime. Social scientists George L. Kelling and James Q. Wilson first outlined the broken windows theory in a 1982 Atlantic article, but the targeted policing it advocates wasn’t widely adopted until 1994, when New York City’s mayor Rudy Giuliani pledged to “clean up” the city. 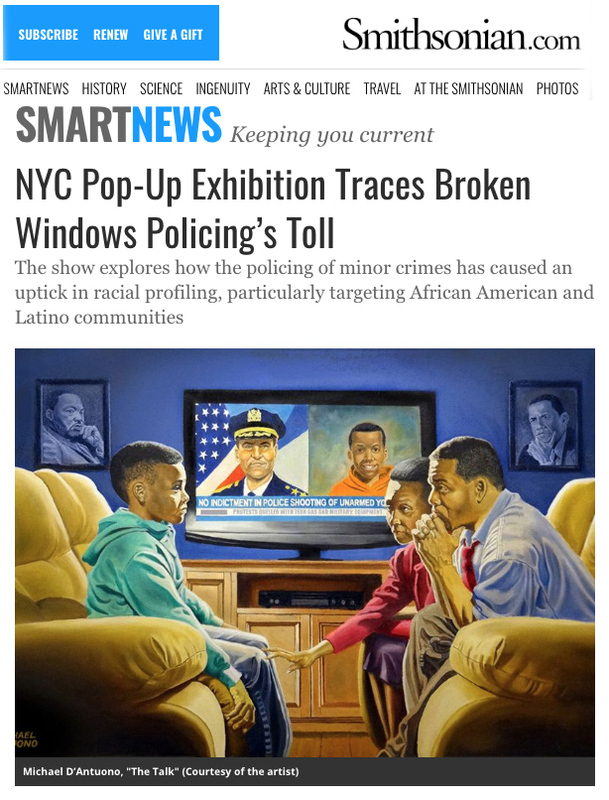 As Sarah Cascone reports for artnet News, the roughly 60 works featured in Manhattan’s latest pop-up exhibition—the New York Civil Liberties Union’s Museum of Broken Windows—use art, archival photographs and newspaper articles to chronicle the toll of that policy, particularly on African American and Latino communities. Broken windows” policing is a criminological theory that suggests a series of unpunished minor crimes, as represented by the eponymous broken window, eventually spirals into a cascade of more serious violent crime. A new series commissioned specifically for the exhibit features Tracy Hetzel’s watercolor portraits of mothers holding picture of their sons, all of whom were killed by the NYPD. As curator Daveen Trentman tells Cascone, these bereaved family members form a “sorority that nobody wants to be in” and have been vocal advocates of police reform. Michael D’Antuono’s “The Talk” perhaps best encapsulates the show’s message. The 2015 painting finds a young African American boy seated on a couch across from his mother and father, who are attempting to describe the tale playing out on a television nearby. On the screen, a news ticker proclaims, “No indictment in police shooting of unarmed youth.” Below these words flash images of a white policeman and an African American boy whose bright orange hoodie mirrors that of the child seated on the couch. The Museum of Broken Windows’ nine-day run is accompanied by a series of talks dedicated to the issues touched on in the show. Scheduled events include “Ending the School to Prison Pipeline,” which discusses hopes of ending police involvement in school disciplinary matters, and “Ending the Police Secrecy Law,” which focuses on the impact of a New York law that protects police misconduct records. “Through art, we will uplift the movement of people who continue to seek justice,” Trentman said in a statement. The Museum of Broken Windows is on view at 9 W. 8th Street, New York City, through September 30. Earlier in the week in Baltimore, we had had hired a 17 ft “It Stops With Cops” mobile billboard to go around the courthouse in hopes of convincing Officer Porter to testify all he knew. As the news of the Porter mistrial broke out, throngs of protesters held up “It Stops With Cops” posters and banners as they chanted for justice for Freddie Gray. 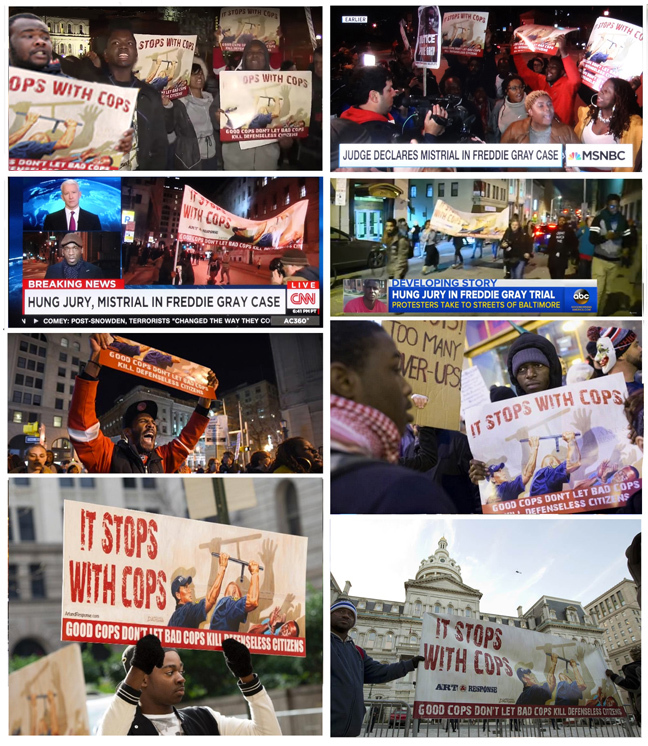 Michael took his “It Stops With Cops” campaign to Chicago on December 10th to protest Mayor Rahm Emanuel’s 14 month delay in getting an indictment and releasing the video of the police murder of Laquan McDonald.